A permanent repair for annoying window leaks! 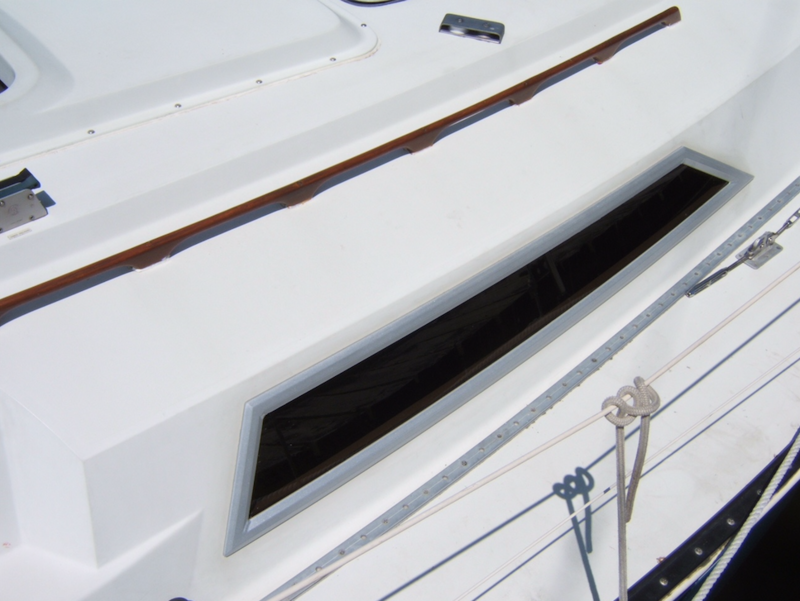 Leaks and the damage they cause can now be eliminated permanently by using FixLeakyBoat's patented system. 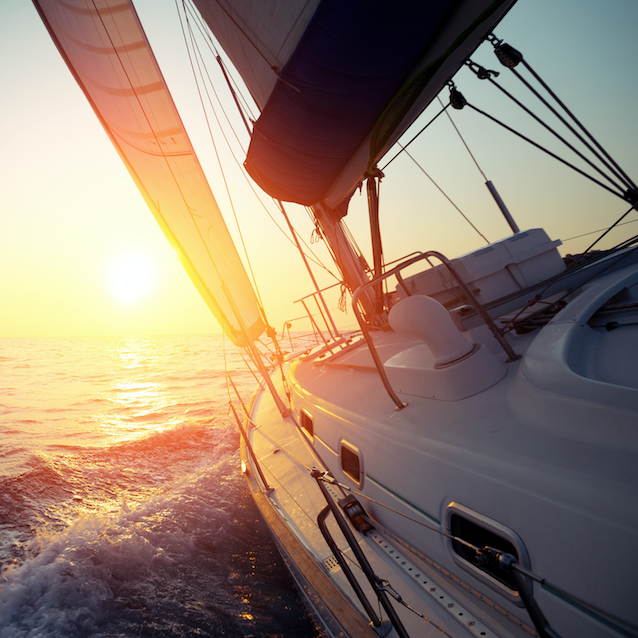 Our product combines custom fabricated marine grade aluminum extrusions and the latest adhesive and sealant technologies used in both aviation and marine industries. 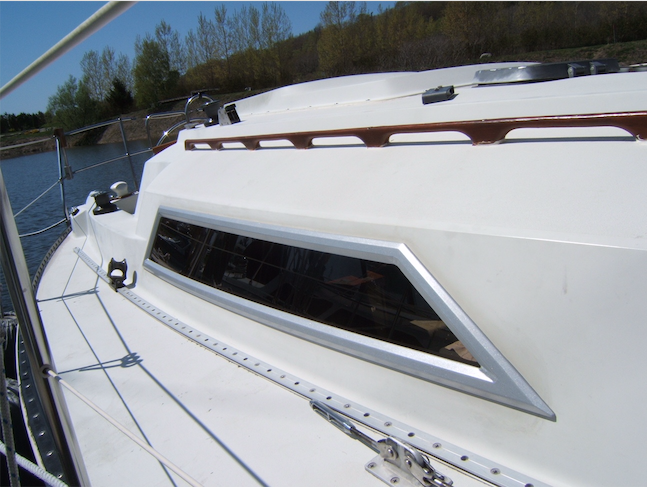 Our superior marine window assembly was developed for boaters who want to protect their boat, increase its life and resale value. Our solution looks good and is maintenance free. Our do-it-yourself kit is easy to install using common hand tools. It includes templates, outside frames, fasteners, sealant and simple instructions. If you have questions during installation, you can contact us and we will help! 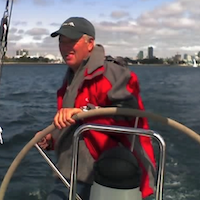 Founded by yacht owner and sailing enthusiast Dan Boisvert, FixLeakyBoats has been providing repair solutions to the marine industry and sailing community since 1995.
with one of Canada's largest yacht brokerage firms, Dan witnessed firsthand, the costly and irreversable damage caused by poorly sealed windows. 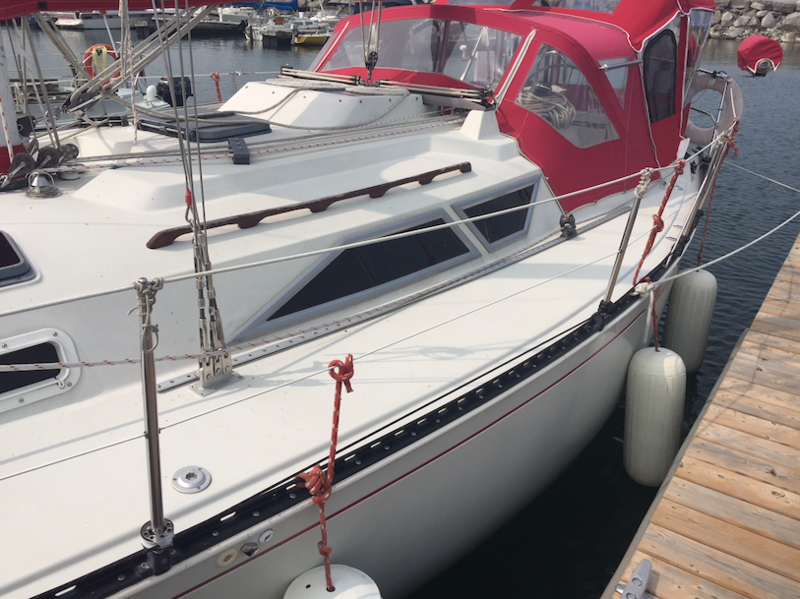 Marine surveys on these vessels repeatedly indicated that expensive repairs could have been avoided. Functionality: The repair had to be robust in its design and ability to perform without compromise. It must not require ongoing maintenance. 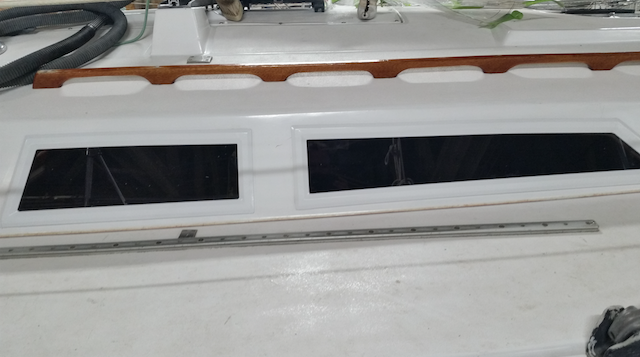 Aesthetically Pleasing: The repair had to look good on the boat. In that regard we have received several comments that "this is how the boat should have left the factory". 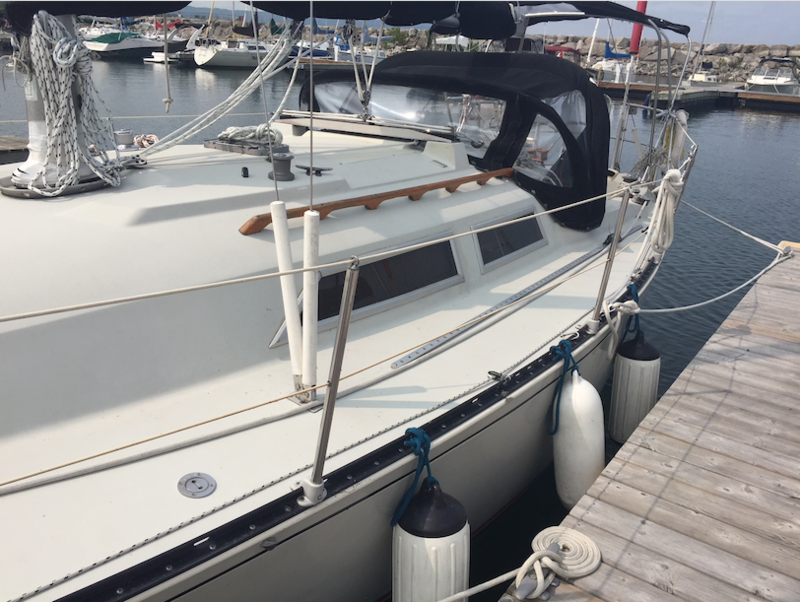 Non Destructive Installation: The repair does not require any modification of existing fiberglass structure on the vessel. This facilitates faster repairs with reduced downtime and makes it possible to make the repair available in "kit form" to boat owners. The repair incorporates a proprietary extrusion and fastening system in conjunction with state of the art sealant/adhesive. 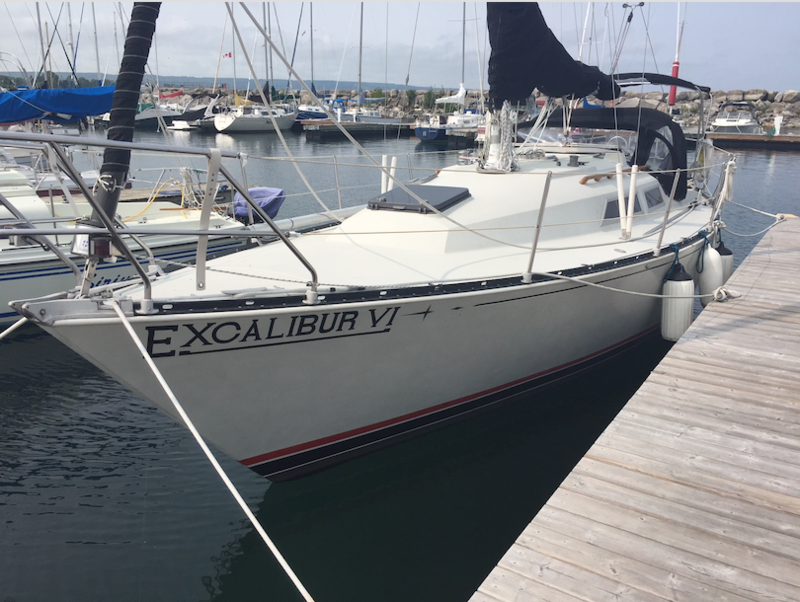 Each and every kit sold is custom designed and manufactured specifically for the model/vessel being repaired. What model boats do you have kits for? 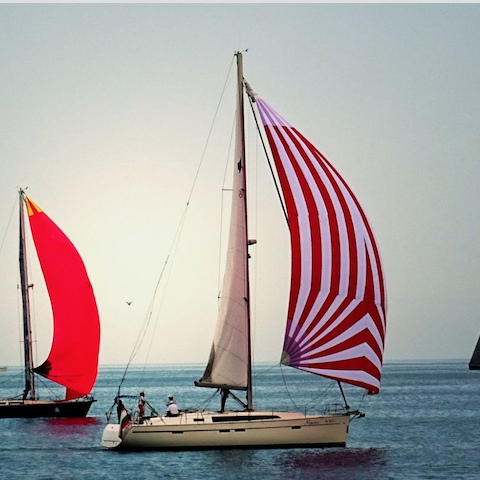 We have templates for most popular modern boats. We also provide custom fittings. Request a quote to learn more. Can I really install the kit myself? If you can operate simple hand tools and have an eye for accuracy then you will have no problem installing the kit. If you would rather have it done for you, please note that in your request and we will provide a quote. All you need is a power drill, a drill bit and counter sink plus a small wrench. The repair kit includes custom fitted powder coated window frames, all hardware, sealing adhesives, fitting templates and instructions. Custom cut plexiglass or lexan glazing is available at an additional cost. What colors do the frames come in? The standard color is a neutral silver aluminum powder coat but you may order a custom color for a small fee. I bought our C&C 29 in 1989 and have enjoyed it for the past 30 years. 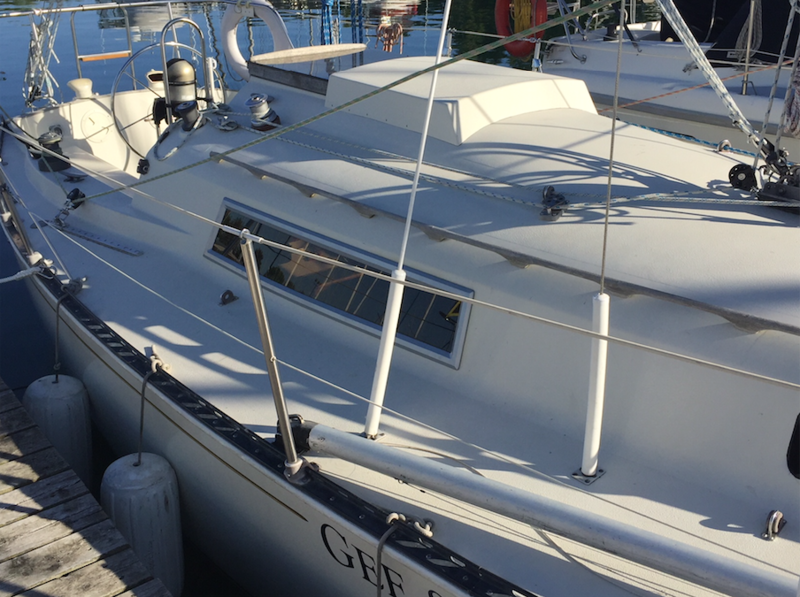 After a few years, the recessed windows which are bonded flush with the sides of the coach roof and which gave the boat its sleek style began to leak. 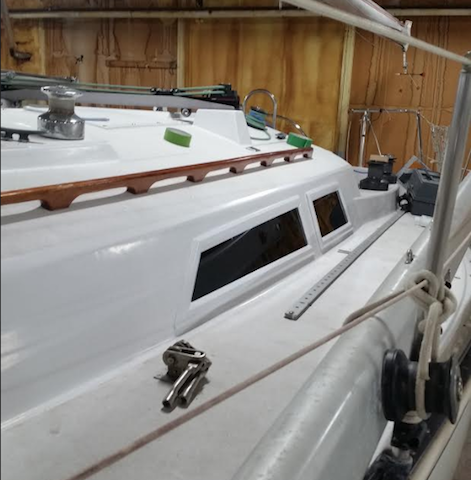 At the onset the leaks were small, and I could apply just a thin bead of marine grade caulking which would solve the problem at least for a while. 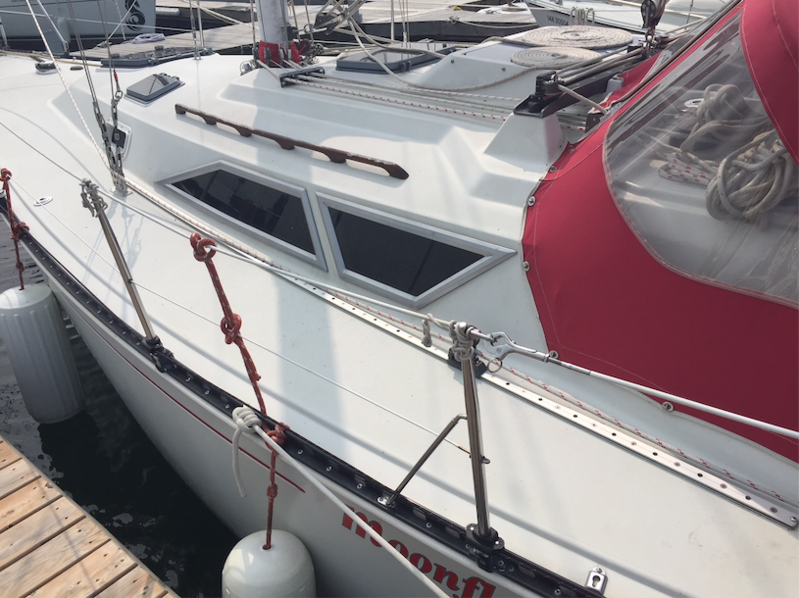 After a time, the adhesive bond degraded even more, due I thought to stresses at the bonding interface caused by the flexing and twisting of the hull. 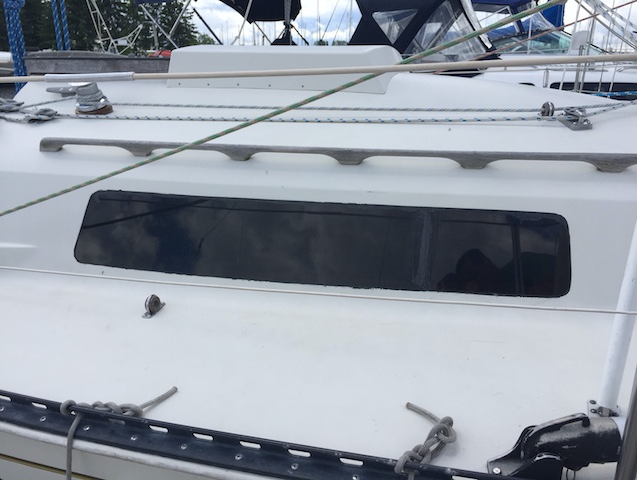 As the situation worsened, I applied more caulking which turned out to be nothing more than a delaying tactic until I could think of a way to remove the windows and rework them completely. Not an easy task. On reflection, I thought there had to be a better way as the business of re-seating fresh Plexiglas windows against the recessed surfaces could not be guaranteed not to fail again. At some point I tried taping over the joint with a variety of adhesive tapes which gave only temporary relief and looked positively ugly. 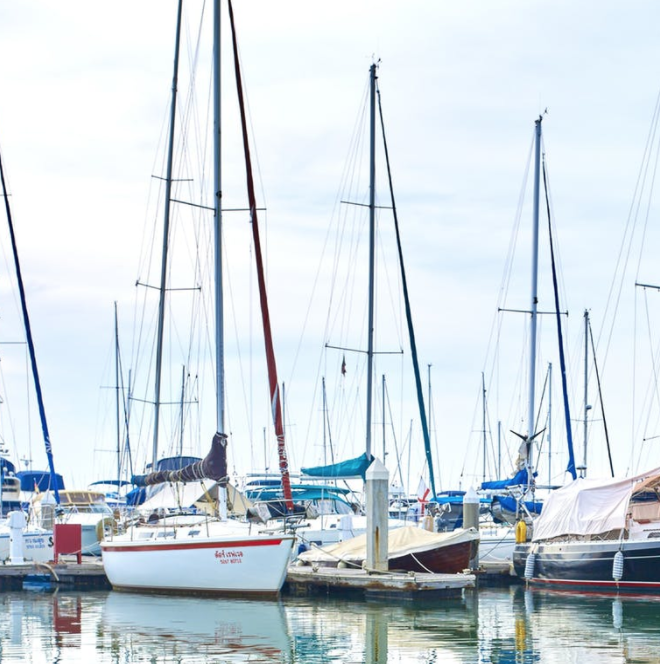 By some accident of fate, Dan Boisvert of Fix Leaky Boats came to our marina to help friends get started with their new boats. On seeing my boat he told me he had the ideal fix for my problem. Naturally I was skeptical at first, until he showed me one of his patented frames. I could see on examining them that here was the ideal engineering solution to C&C leaky windows; one that the manufacturer might have considered in the first place. Dan replaced our windows with his patented window frames in 1999 and they have never leaked since and given absolutely no concerns whatsoever. Clearly this is a testament to the most effective and durable engineering solution ever conceived. I have nothing but admiration for the ‘Fix Leaky Boats’ product. 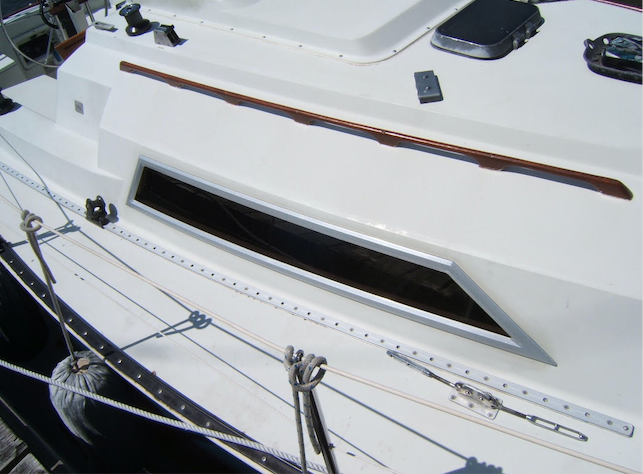 More to the point is the fact that once installed, the frames with their durable powder coating finish are the most elegant solution a boater could wish for while preserving its appearance and helping to maintain value. Did you try any other options before using the kit? 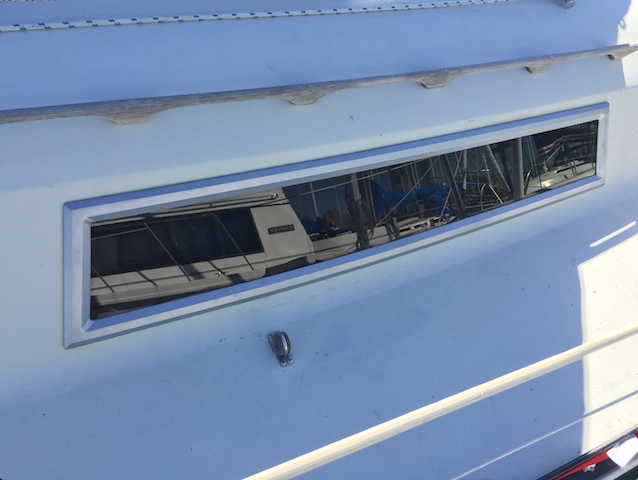 “I am incredibly happy with the FixLeakyBoats product and have confidently recommended this repair to several other boats owners with leaky windows.” - Les S.
How was your experience/ service?